The choirs from Southern Utah University’s Department of Music perform their 3rd Annual Rock and Roll Concert, EuroPOP! The SUU Choirs and Music Tech 3rd Annual Rock and Roll Show, Tuesday, February 20, 2018, 7:30 p.m. at Heritage Center Theater. Europop’s upbeat, dance-friendly style will have audience members dancing in their seats. Admission is $10 for adults, $8 for Alumni with card, and $5 for youth. SUU faculty, staff, and students can get in free with a valid ID card. EuroPOP! 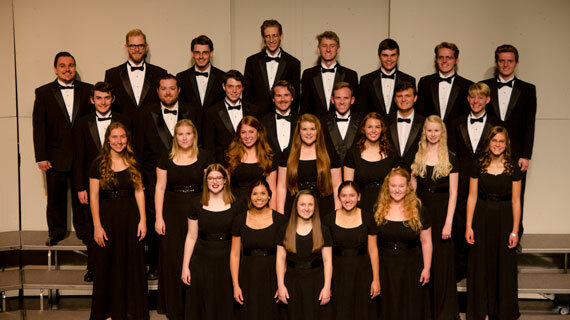 The SUU Choirs and Music Tech 3rd Annual Rock and Roll Show is a follow up to last year's show that featured the music of The Beatles, the leaders of the musical British Invasion. Featuring music from A-Ha, Thompson Twins, and ABBA, you won’t want to miss these upbeat tempos, light lyrics, and dynamic rhythms. The Phat Old Professors from Ephraim will join vocal soloists and choir members in performing musical numbers such as: “What is Love”, “Macarena”, and “The Final Countdown.” These songs have not only shaped music, they have had a huge impact on the music video and DanceCrazy world. Students participating in the Master of Music in Music Technology program have also worked on making this concert unforgettable. Join us in a night of nostalgia and fan favorites. For more information on SUU’s Department of Music, please visit www.suu.edu/pva/music.